This article is about the Japanese archaeological culture. For the Korean archaeological culture, see Jeulmun period. The Jōmon period (縄文時代, Jōmon jidai) is the time in Prehistoric Japan from about 16,500 years ago to about 2,300 years ago when Japan was inhabited by a hunter-gatherer culture, which reached a considerable degree of sedentism and cultural complexity. The name "cord-marked" was first applied by the American scholar Edward S. Morse who discovered shards of pottery in 1877 and subsequently translated it into Japanese as jōmon. The pottery style characteristic of the first phases of Jōmon culture was decorated by impressing cords into the surface of wet clay. This pottery, dated to around 16,000 years ago, seems to be the second oldest in the world; the oldest one has now been found in China. Pottery in the Russian Far East, and in Korea is also very old. Jomon period was rich in tools and jewelry made from bone, stone, shell, and antler; pottery figurines and vessels; and lacquered wood. This culture is often compared to pre-Columbian cultures of Pacific Northwest North America because in both regions cultural complexity developed within a primarily hunting-gathering context (with limited use of horticulture). The very long—approximately 14,000 years—Jōmon period is conventionally divided into a number of phases: Incipient (16,500-10,000 years ago), Initial (10,000-7,000), Early (7,000-5,450), Middle 5,450-4,420), Late (4,420-3,220) and Final (3,220-2,350), with the phases getting progressively shorter. The fact that this entire period is given the same name by archaeologists should not be taken to mean that there was not considerable regional and temporal diversity; the chronological distance between the earliest Jōmon pottery and that of the more well-known Middle Jōmon period is about twice as long as the span separating the building of the Great Pyramid of Giza from the 21st century. Traces of Paleolithic culture, mainly stone tools, occur in Japan from around 30,000 BC onwards. The earliest "Incipient Jōmon" phase began while Japan was still linked to continental Asia as a narrow peninsula. As the glaciers melted following the end of the Last glacial period (approximately 12,000 years ago), sea levels rose, separating the Japanese archipelago from the Asian mainland; the closest point (in Kyushu) about 190 km (120 miles) from the Korean Peninsula is near enough to be intermittently influenced by continental developments but far enough removed for the peoples of the Japanese islands to develop their own ways. Within the archipelago the vegetation was transformed by the end of the Ice Age. In southwestern Honshu, Shikoku, and Kyushu, broadleaf evergreen trees dominated the forests, whereas broadleaf deciduous trees and conifers were common in north-eastern Honshu and southern Hokkaido. Many native tree species, such as beeches, buckeyes, chestnuts, and oaks produced edible nuts and acorns. These provided abundant sources of food for humans and for animals. In the northeast, the plentiful marine life carried south by the Oyashio current, especially salmon, was an additional major source of food. Settlements along both the Sea of Japan and the Pacific Ocean subsisted on immense amounts of shellfish, leaving distinctive middens (mounds of discarded shells and other refuse) that are now prized sources of information for archeologists. Other sources of food meriting special mention include deer, wild boar, yam-like tubers and other wild plants, and freshwater fish. Supported by the highly productive deciduous forests and an abundance of seafood, the population was concentrated in central and northern Honshu, but Jōmon sites range from Hokkaido to the Ryukyu Islands. The earliest pottery in Japan was made at or before the start of the Incipient Jōmon period. In 1998 small fragments were found at the Odai Yamamoto I site, which have been dated to 14,500 BC; subsequently, pottery of roughly the same age was found at other sites such as Kamikuroiwa and Fukui Cave. At present it appears that pottery emerged at roughly the same time in Japan, and in the Amur River basin of far eastern Russia. The degree to which horticulture or small-scale agriculture was practiced by Jōmon people is debated. There is evidence to suggest that arboriculture was practiced in the form of tending groves of nut- and lacquer-producing trees. From many sites (including Torihama, Sannai Maruyama and Mawaki) of the Early Jomon and Middle Jomon period, scientists have studied pollen and many seeds and grains under their powerful scanning electron microscopes and identified many of them. They now know that the Jomon people cultivated these plants: boehmeria nettle, hemp, egoma and shiso mint (Perilla), bottle gourd (Lagenaria), buckwheat (Fagopyrum), barley (Hordeum vulgare), barnyard millet (Echinocloa), bean (Leguminosae), green gram (Vigna radiata), soybean, burdock (Arctium lappa), and rice (Oryza sativa). Yamaimo or mountain potato and the taro potato were also likely cultivated root plants. An apparently domesticated variety of peach appeared very early at Jomon sites in 6700–6400 BP (4700–4400 BC). This was already similar to modern cultivated forms. This domesticated type of peach was apparently brought in to Japan from China. Nevertheless, in China, itself, this variety is currently attested only at a later date of ca. 5300 to 4300 BP. By the end of the Incipient Jōmon phase, around 8,000 BC, a semi-sedentary lifestyle apparently led to an increase in population density, so that the subsequent phase, the Initial Jōmon, exhibits some of the highest densities known for foraging populations. Genetic mapping studies by Cavalli-Sforza have shown a pattern of genetic expansion from the area of the Sea of Japan towards the rest of eastern Asia. This appears as the third principal component of genetic variation in Eurasia (after the "Great expansion" from the African continent, and a second expansion from the area of Northern Siberia), which suggests geographical expansion during the early Jōmon period. These studies also suggest that the Jōmon demographic expansion may have reached America along a path following the Pacific coast. The Early and Middle Jōmon periods saw an explosion in population, as indicated by the number of settlements from this period. These two periods occurred during the Holocene Climatic Optimum (between 4000 BC and 2000 BC), when the local climate became more humid. Highly ornate pottery dogū figurines and vessels, such as the so-called "flame style" vessels, and lacquered wood objects remain from that time. Interestingly, although the ornamentation of pottery increased over time, the ceramic fabric always remained quite coarse. This period saw a rise in complexity in the design of pit houses, the most commonly used method of housing at the time, with some even having stone paved floors. Study in 2015 found that this form of dwelling continued up to Satsumon culture. After 1500 BC, the climate cooled, and populations seem to have contracted dramatically. Comparatively few archaeological sites can be found after 1500 BC. During the Final Jōmon period, a slow shift was taking place in western Japan: steadily increasing contact with the Korean peninsula eventually led to the establishment of Korean-type settlements in western Kyushu, beginning around 900 BC. The settlers brought with them new technologies such as wet rice farming and bronze and iron metallurgy, as well as new pottery styles similar to those of the Mumun culture. The settlements of these new arrivals seem to have coexisted with those of the Jōmon and Yayoi for around a thousand years. The new farming culture is called Yayoi after an archaeological site near Tokyo. The Final Jōmon is succeeded by the Yayoi period (ca. 300 BC-AD 300) outside Hokkaido; within Hokkaido the Jōmon is succeeded by the Zoku-Jōmon (post-Jōmon) or Epi-Jōmon period. The Zoku-Jōmon culture is in turn succeeded by the Satsumon culture around the 7th century. The foundation myths of the origins of Japanese civilization extend back to periods now regarded as part of the Jōmon period, though they show little or no relation to what we know archaeologically of Jōmon culture. 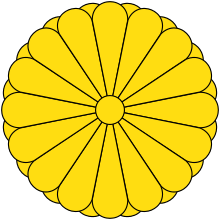 11 February 660 BC is the traditional founding date of the Japanese nation by Emperor Jimmu. This version of Japanese history, however, comes from the country's first written records, the Kojiki and Nihongi or Nihon shoki, dating from the 6th to the 8th centuries AD, after Japan had adopted the Chinese writing system (Go-on/Kan-on). Some elements of modern Japanese culture may date from this period and reflect the influences of a mingled migration from the northern Asian continent and the southern Pacific areas and the Jōmon peoples. Among these elements are the precursors to Shinto religion, some marriage customs, architectural styles, and technological developments such as lacquerware, laminated bows, metalworking, and glass making. The relationship of Jōmon people to the modern Japanese and Ainu remains uncertain. Some consider the Japanese of today to be descended from a mixture of the ancient hunter-gatherer Jōmon culture and the Yayoi culture rice agriculturalists. According to this theory these two major ancestral groups came to Japan over different routes at different times. Recent Y-DNA haplotype testing has led to the popularly accepted (though untested) hypothesis that haplogroup D-M55 Y-DNA, which has been found in some percentages of samples of modern Japanese, Ryukyuan, and Ainu males, may reflect patrilineal descent from members of a Jōmon period culture of the Japanese Archipelago. Analysis of mitochondrial DNA of Jomon skeletons from Hokkaido indicates that haplogroups N9b and M7a may reflect maternal Jomon contribution to the modern Japanese mtDNA pool. A 2016 study on ancient Jomon aDNA from Sanganji shell mound estimates that the modern Japanese population inherited less than 20% of their DNA from the ancient Jomon populations. Mark J. Hudson of Nishikyushu University posits that Japan was settled by a Proto-Mongoloid population in the Pleistocene who became the Jōmon, and that their features can be seen in the Ainu and Okinawan people. The Jomon share some physical characteristics, such as relatively abundant body hair, with Caucasians, but anthropological genetics shows them to derive from a completely separate genetic lineage from that of Europeans. 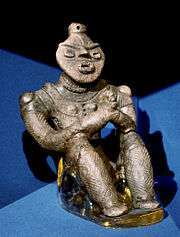 Jomon shows closest genetic relationship to Southeast Asians rather than western Eurasian people. Late Jomon clay head, Shidanai, Iwate Prefecture, 1500–1000 BC. 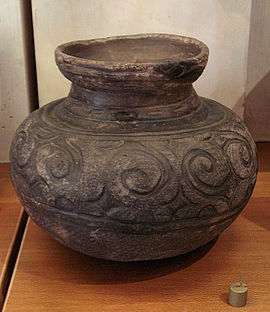 A Middle Jomon jar. 2000 BC. ↑ Jomon Fantasy: Resketching Japan's Prehistory. June 22, 1999. 1 2 Perri, Angela R. (2016). "Hunting dogs as environmental adaptations in Jōmon Japan". Antiquity. 90 (353): 1166. doi:10.15184/aqy.2016.115. ↑ Kuzmin, Y.V. (2006) Chronology of the Earliest Pottery in East Asia: Progress and Pitfalls. Antiquity 80: 362–371. ↑ Birmingham Museum of Art (2010). Birmingham Museum of Art : Guide to the Collection. [Birmingham, Ala]: Birmingham Museum of Art. p. 40. ISBN 978-1-904832-77-5. ↑ 長野県立歴史館 (1996-07-01). "縄文人の一生". Comprehensive Database of Archaeological Site Reports in Japan. Retrieved 2016-09-02. ↑ Koyama, Shuzo, and David Hurst Thomas (eds.). (1979). Affluent Foragers: Pacific Coasts East and West. Senri Ethnological Studies No. 9. Osaka: National Museum of Ethnology. ↑ Aikens and Rhee, eds. (1993) Pacific Northeast Asia in Prehistory: Hunter-Fisher-Gatherers, Farmers, and Sociopolitical Elites. Pullman: Washington State University Press. 1 2 Habu, Junko (2004). Ancient Jomon of Japan. Cambridge University Press. ISBN 0-521-77213-3. 1 2 "Early Pottery at 20,000 Years Ago in Xianrendong Cave, China". Science. 336 (6089): 1696–1700. June 29, 2012. doi:10.1126/science.1218643. PMID 22745428. Retrieved June 29, 2012. ↑ "Chinese pottery may be earliest discovered." Associated Press. 2009-06-01. ↑ Craig, O.E; Saul, H. "Earliest evidence for the use of pottery". Nature (journal). doi:10.1038/nature12109. ↑ Matsui, A. and M. Kanehara (2006) The Question of Prehistoric Plant Husbandry During the Jomon Period in Japan. World Archaeology 38(2). ↑ Yang, Xiaoyan; Zheng, Yunfei; Crawford, Gary W.; Chen, Xugao (2014). "Archaeological Evidence for Peach (Prunus persica) Cultivation and Domestication in China". PLoS ONE. 9 (9): e106595. doi:10.1371/journal.pone.0106595. ISSN 1932-6203. ↑ "Jōmon population densities are among the highest recorded for a foraging population, although in some areas of the Pacific Coast of North America, comparable and even higher figures of population densities have been observed (Hassan, 1975)." Luigi Luca Cavalli-Sforza, The History and Geography of Human Genes p249, ISBN 0-691-08750-4. ↑ "The third synthetic map shows a peak in Japan, with rapidly falling concentric gradients... Taken at face value, one would assume a center of demographic expansion in an area located around the Sea of Japan." Luigi Luca Cavalli-Sforza, The History and Geography of Human Genes p249, ISBN 0-691-08750-4. ↑ "The synthetic maps suggest a previously unsuspected center of expansion from the Sea of Japan but cannot indicate dates. This development could be tied to the Jōmon period, but one cannot entirely exclude the pre-Jōmon period and that it might be responsible for a migration to the Americas. A major source of food in those pre-agricultural times came from fishing, then as now, and this would have limited for ecological reasons the area of expansion to the coastline, perhaps that of the Sea of Japan, but also farther along the Pacific Coast." Luigi Luca Cavalli-Sforza, The History and Geography of Human Genes p253, ISBN 0-691-08750-4. ↑ "三内丸山遺跡調査概報". Comprehensive Database of Archaeological Site Reports in Japan. Retrieved 2016-09-01. ↑ Moriya, Toyohito. "A Study of the Utilization of Wood to Build Pit Dwellings from the Epi-Jomon Culture". HUSCAP (journal). doi:10.14943/jgsl.10.71. ↑ OKimori Takuya "日本の漢字1600年の歴史　(1600 years of history in Japanese Kanji)"
↑ Hanihara, K. (1984) Origins and Affinities of Japanese Viewed from Cranial Measurements. Acta Anthropogenetica 8(1–2): 149–158. ↑ Hammer, M.F. et al (2006) Dual Origins of the Japanese: Common Ground for Hunter-Gatherer and Farmer Y Chromosomes. Journal of Human Genetics 51: 47–58. ↑ Nakahori, Yutaka (2005). Y染色体からみた日本人 (Y Senshokutai kara Mita Nihonjin). Iwanami Science Library. ISBN 978-4-00-007450-6. ↑ Adachi, N., Shinoda, K., Umetsu, K., Matsumura, H. "Mitochondrial DNA analysis of Jomon skeletons from the Funadomari site, Hokkaido, and its implication for the origins of Native American." American Journal of Physical Anthropology (Mar. 2009) 138(3):255-65. ↑ Hideaki, Kanzawa-Kiriyama; et al. (2016). "A partial nuclear genome of the Jomons who lived 3000 years ago in Fukushima, Japan". Journal of Human Genetics. doi:10.1038/jhg.2016.110. ↑ Powell, Joseph F.; Rose, Jerome C. Chapter 2 Report on the Osteological Assessment of the Kennewick Man Skeleton (CENWW.97.Kennewick). Retrieved September 10, 2011. Temple DH. 2007. "Stress and dietary variation among prehistoric Jomon foragers." American Journal of Physical Anthropology 133: 1035–1046. Temple DH. 2008. "What can stature variation reveal about environmental differences between prehistoric Jomon foragers? Understanding the impact of developmental stress on environmental stability." American Journal of Human Biology 20:431–439.